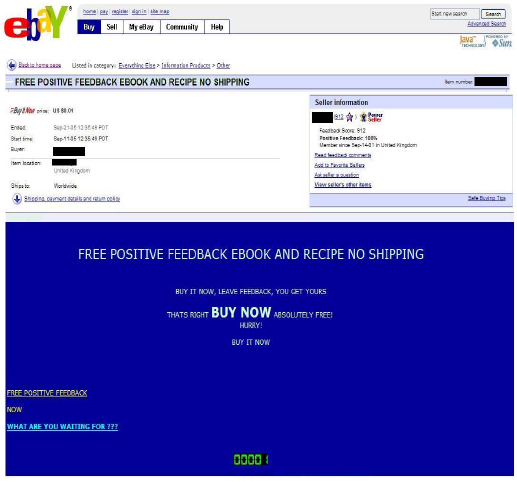 You can buy a positive feedback on eBay for 29 cents, so how much is it worth? (the image is from the same authors paper “Reputation in Online Markets: Some Negative Feedback”). Does such a listing make sense? Well, it depends. The article goes on saying that the sellers, after getting a wonderful reputation, are probably going to move in very profitable markets such as selling cars or lands. For example, the authors found one particular seller, whom they dubbed the landseller, who had accumulated hundreds of feedback points by posting 304 offers for feedback enhancement on eBay (and losing $87.64). Then, after his feedback rating reached 598, the landseller went on to try to sell several parcels of undeveloped land in the southern U.S. on eBay. This is one more example of a trust metric attack: every time someone provide a system based on reputation, some people will try to fool and attack it. No system is totally attack resistant. And this is uber interesting. This entry was posted in Uncategorized and tagged attack, eBay, reputation, trust on 4 April 2007 by paolo.